Elite pitching with World Class velocity will be short lived. The human arm is not built to accelerate and decelerate at the speeds and angles required to throw a baseball over 90 mph. The risks to ill effects increases the harder each pitcher throws. For pitchers to stay healthy, they need to emulate Greg Maddux more than Pedro Martinez. On the other hand, no-one would kick a prospect out of bed for pitching like Pedro Martinez. For years, "mechanics" has been the beginning and end of stories related to pitchers' health. Yet, we still have professional pitchers throwing with an inverted W in their arm load motion that has continuously portended arm injuries. Teams need to teach against that tendency. It would also reward teams to stress the importance of pacing one's self. Starting pitchers will say that they obviously already pace themselves. Only relief pitchers can go max effort on every pitch. My guess is that most starting pitchers are still not pacing themselves enough. Matt Harvey was lights out, sitting at 96 mph on his 4-seamer. Wouldn't he have been able to succeed at 93, only reaching back for 97 a few times each game? How many more runs would he have allowed pitching that way? Would he be healthy today pitching that way? Is pitching that way even possible? Or, is there something fundamentally unnatural about constantly throwing to far beneath your max effort? I tend to think it's possible. Boxers will talk about throwing punches at Max effort, vs an effort that's sustainable for an entire round and a series of rounds. Boxing is about as primal a sport as we have. If boxers can naturally pace themselves, so should professional baseball players. *Okay, that 95% number is totally coming from a place that has no basis in fact. I'm guessing, making tj up, and don't even know precisely what it means. My point is that shoulder injuries to the smaller, more delicate muscles of the rotator cuff are more fatal than those to a larger shoulder, chest, or back muscle. Back to hoping good things for some of the best young arms in the game... Madison Bumgarner has a chance to put together an extremely special career, if he can get back to where he was a year or two ago. Nathan Eovaldi is blossoming into one of the hardest throwing starters in baseball. That, alone, should be a red flag to the Marlins. Gio Gonzalez does not have great mechanics, neither do Zack Wheeler nor Michael Wacha. Have you seen Shelby Miller's numbers this year? He might already be broken. 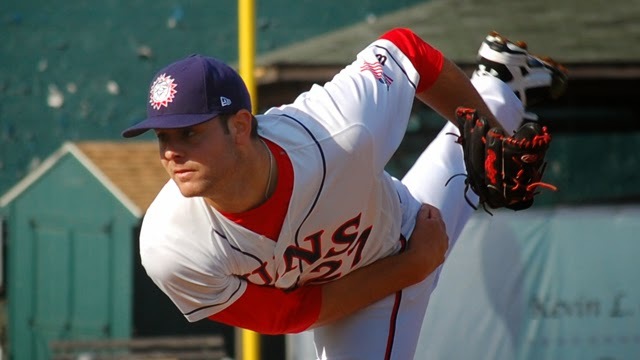 In the minor leagues, we can worry about Lucas Giolito, Noah Syndergaard, Kohl Stewart, Hunter Harvey, plus a bunch of guys on the Cardinals, Astros and Blue Jays. More and more, amateur pitchers in high school and college are falling victim to the exploding elbow. We are talking about the best power arms of the future. Baseball needs to protect them better, but can they? We don't know of any one certain way that anyone can be protected. Teams need to start calling up young pitchers as soon as they show they are one of the 11 best pitchers in the organization. We were all shocked when the Marlins decided to call-up Jose Fernandez at the start of last season. He was so young, and the Marlins were so non-competitive. Why would they start his service time on a lousy team? Why risk calling him up too early, letting him get hit hard if that the case? Why? We couldn't understand it, other than to think that maybe they were looking for a gate attraction at every fifth home game. Looking back, how glad are we that the Marlins introduced us to Fernandez last season? A traditional team would have had him in a couple of minor league levels that last 18 months, and he would have broken his elbow before his Major League debut. The Nationals wasted a lot of Stephen Strasburg's bullets before finally calling him up. Teams, especially the rich teams, will probably begin to value potential Major League contributions of any elite prospect right away - while they're actually healthy. Many will say that the biggest problem with arm injuries is how unpredictable they are. No-one has agreed on proven best practices for maintaining health. It seems the actual problem is contrarian. My biggest issue with arm injuries is that they are becoming too predictable. Everyone's getting one.